Cast: Emilie de Ravin, Hugo Weaving, Jim Sturgess, Ryan Kwanten. This animated-film is based on the first three books of the epic fantasy series ‘Guardian of Ga’Hoole’. 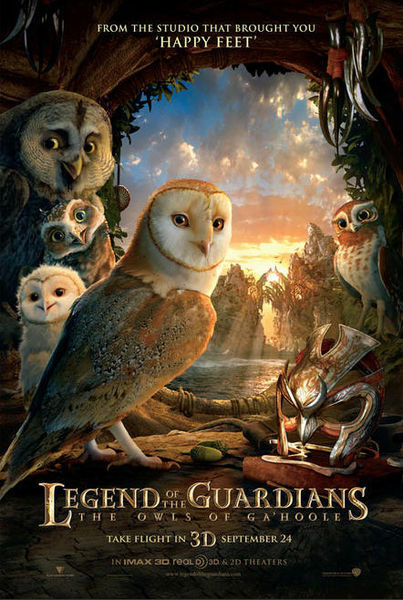 The story focuses on young adventurous and talented owl named Soren, who has been listening the stories about the legendary Guardians of Ga’Hoole from his father. One night he and his brother got kidnapped by The Pure Ones, along with many other young owls. He later escapes after finding out their evil plans and set on a journey to seek the legendary Guardians for help. I appreciate the CG visuals and effects, I was absolutely in awe, but the movie itself is pretty boring. I was actually quite surprised at how uninteresting and cliche it is because this was based on three books. If this is already boring, reading the books must be a total drag. Hugo Weaving was totally wasted on a very cameo role and because I’m quite a fan of Hugo Weaving, I’m not gonna tell you how annoyed I was by the British and Aussie accents of practically all the owls. And much to my distaste, two songs by Owl City can be heard in this film. Verdict: Fantastic CG graphics but typical storyline. Lacks of emotion and humour. Too short for a film that’s based on three books. More suitable for kids. Favourite scene: (SPOILER BEGINS HERE) The scene where they are flying in the rain of “baggywrinkles”. I was absolutely amazed by the stunning visuals (SPOILER ENDS HERE). Subtitles: They should not have implemented the subtitles for the 3-D screenings of films. They are utterly distracting. Gives me the feeling that I’d get slapped in the eyeballs if I didn’t read them. Photo from Li Kee, taken by Henry.